The Sandman, written by New York Times best-selling author Neil Gaiman, was the most acclaimed comic book title of the 1990s. A rich blend of modern myth and dark fantasy in which contemporary fiction, historical drama and legend are seamlessly interwoven, The Sandman is also widely considered one of the most original and artistically ambitious series of the modern age. By the time it concluded in 1996, it had made significant contributions to the artistic maturity of comic books and become a pop culture phenomenon in its own right. Now, DC Comics is proud to present this comics classic in an all-new Absolute Edition format. 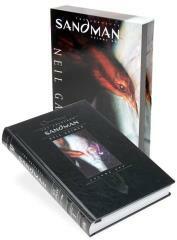 The first of four beautifully designed slipcased volumes, The Absolute Sandman Vol. 1 collects issues #1-20 of The Sandman and features completely new coloring, approved by the author on the first 18 issues, as well as a host of never-before-seen extra material including the complete original Sandman proposal, a gallery of character designs from Gaiman and the artists who originated the look of the Sandman, and the original script for the World Fantasy Award-winning The Sandman #19, "A Midsummer Night's Dream," together with reproductions of the issue's original pencils by Charles Vess. Also included are a new introduction by DC President and Publisher Paul Levitz and an afterword by Gaiman.